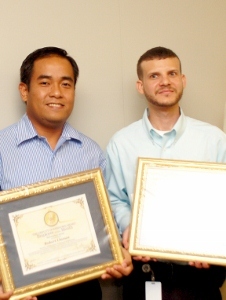 (CNS): A financial controllerwho came up with an innovative enhancement of revenue collection and a junior support administrator in the IT team at John Gray High School with a people-oriented approach to problem solving problem are the latest two winners of the Civil service employee of the month scheme. Nicholas McLean and Robert Llamas are both from the ministry of education, financial services and employment which has claimed four of the five awards since the scheme started. The men received the November and December internal awards for civil servants who are nominated within their departments on a monthly basis. The awards recognise high standards which are expected from all public sector workers. A committee of Chief Officers then selects an Employee of a Month from among the Chief Officer’s Choice award winners. “I am impressed by Mr Llamas’ performance and particularly pleased with his track record of training Caymanians. I also congratulate Mr. McLean, whose innovative approach to his work is commendable. As a young Caymanian, he has a very bright future in the Civil Service,” said Franz Manderson, deputy governor and the person who started the award scheme. Llamas said he was honoured to receive the award. “When I joined the financial team in the Ministry, they were going through a critical restructuring phase. This allowed me as a person to grow through the experiences we had during this time, and I am very grateful to have been a part of this project,” he added. Crediting his colleagues for their support, Mclean said the recognition was for the entire ICT team at the school. Llamas and McLean are the third and fourth winners respectively from the Ministry of Education. Rodrigues said that morale at the Ministry has received a tremendous boost from the recognition that the team is receiving. We have a very diverse and hard-working team, with many true servant leaders, dedicated to making a positive difference through their work. “I am proud of and impressed by their contributions and commitment,” she said about the latest awardees from the ministry. Previous recipients are John Gray High School Principal, Lyneth Monteith, Chief Conservation Officer in the Department of Environment (DoE), Mark Orr, and At-Risk Youth Programme Coordinator, Michael Myles. An award for innovative enhancement of revenue collection at the Ministry of Education. This musr be a joke. Right?? ?